OpsCenter gives all stakeholders the power to strategize and tactically collaborate by sharing real-time views of a scene with minimal latency from any connected device. Anyone in your organization can see live pilot sessions, and multiple users can work together seamlessly via chat and by marking points of interest. Incident commanders can task pilots directly by assigning waypoints or search areas with a simple touch of their maps. Leverage the power of drone technology for any mission with secure encrypted sharing. 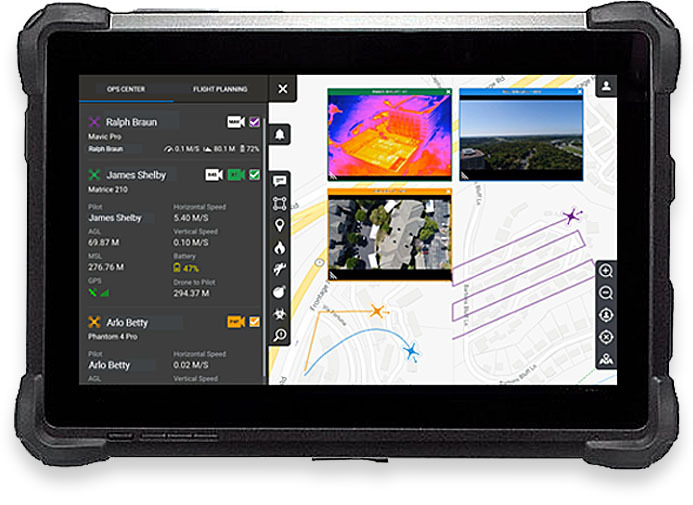 Even in an offline environment, our (optional) ruggedized tablet still enables users to share all of these capabilities with minimal latency from any connected device and to collaborate dynamically. Anywhere. OpsCenter’s instant communication and sharing capabilities enable operations command to direct assets by dropping waypoints, sending text instructions, or sharing areas of interest to explore -- all with a few taps of their screen. 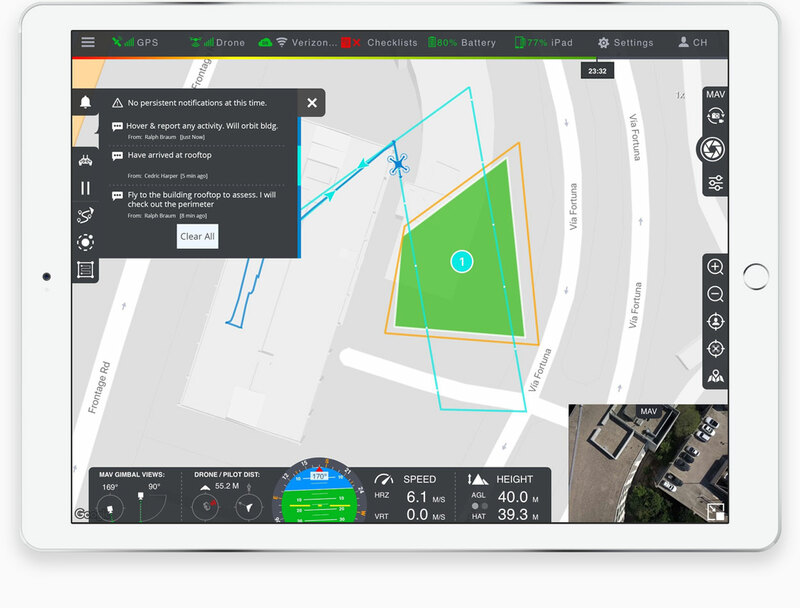 Pilots instantly receive these instructions in their Pilot app, enabling them to respond quickly and complete objectives with minimal distraction. 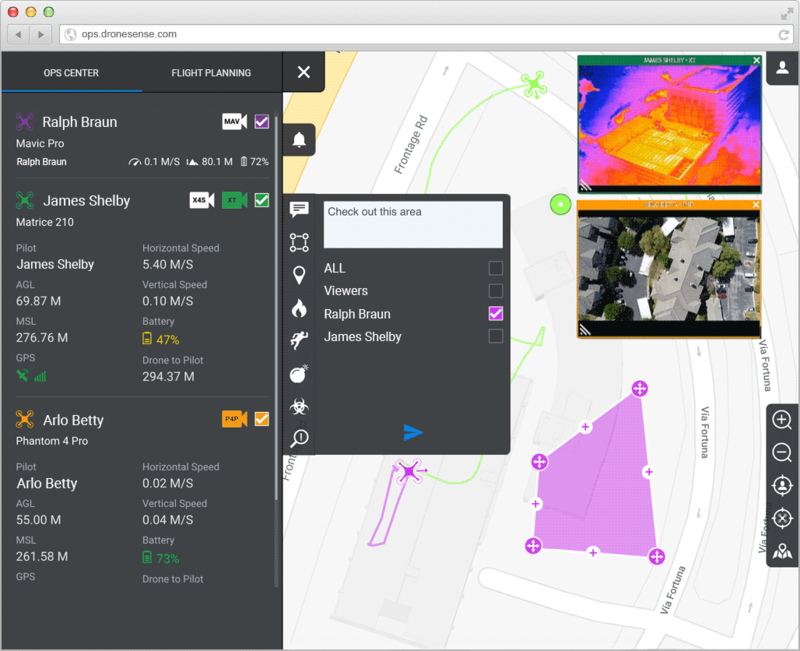 OpsCenter gives you the power to securely share information with stakeholders on-scene, including real-time pilot sessions with full telemetry and video. With a broader network connection, you can also share full pilot sessions with remote stakeholders. Sessions can even be shared between pilots. This expands collaboration capabilities, thereby maximizing the strategic effectiveness of any operation. OpsCenter allows for multiple pilots and stakeholders to communicate and collaborate easily on a scene. Pilots working in teams can visualize each other on their screens, eliminating task redundancies and chance collisions while preserving precious battery time. By toggling between live video feeds, operations command can leverage their collective visuals to provide more comprehensive scene intelligence to complete missions successfully. OpsCenter functions securely over the cloud when there is available network connectivity. However, it is also functional anywhere when using the (optional) ruggedized tablet we offer. This tablet features an outdoor-viewable capacitive touch screen (1,000 nits), i7 quad-core processor, NVIDIA graphics card, is IP65-rated, and much more. It is scalable enough to support sharing of communications, intelligence, and many other capabilities. OpsCenter Anywhere provides the flexibility for any stakeholders in a mission to sync and connect with each other no matter their location. OpsCenter is the ideal tool to conduct Search and Rescue (SAR) operations. The sharing and collaboration possible with OpsCenter technology works in even the most remote areas. 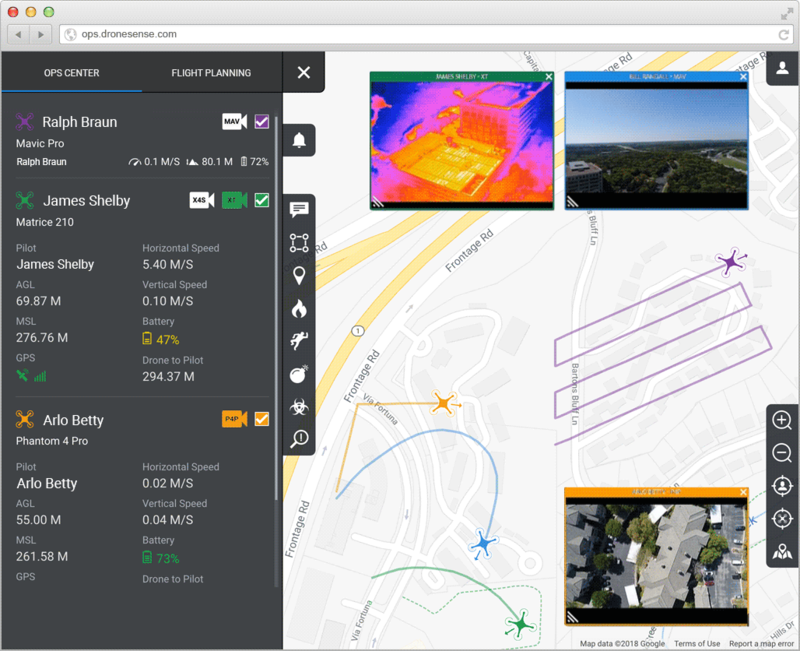 DroneSense offers specific functionality for SAR, and empowers collaboration between pilots, operations command, and search members on foot. Operations command can also indicate areas that merit further investigation. This level of collaboration, enhanced through the use of drones, leads to unparalleled efficiency when time is of the utmost importance.